Candace’s ten-year plan has two flaws, year eleven and Colin. Everyone who meets Candace wearing one of her colorful wigs knows she is a cancer survivor. Determined to live life to the fullest, her accomplishments range from painting murals to convincing students on campus to give up drinking. Few people know the secret to her success includes a detailed ten-year plan and a bucket list full of check marks. Candace never dreamed she’d make it to year eleven. Computer expert Colin Ogilvie can navigate the most difficult codes. While his friends were chasing girls, he was hacking past firewalls and developing billion-dollar apps. He never felt he was missing out until he met Candace. After five hundred and twelve days in the friend zone, he wonders if he can ever crack the code to the wall protecting her heart. What science can’t solve, art can. Their relationship changes when a meddling friend commissions Candace to help restore an antique merry-go-round. As Candace brings new life to the old merry-go-round, she discovers her own life can have a different path than she planned. But is she brave enough to not only reveal her biggest secrets to Colin but brave a chance on her own happily ever after? Lorin Grace was born in Colorado and has been moving around the country ever since, living in eight states and several imaginary worlds. She graduated from Brigham Young University with a degree in Graphic Design. Currently, she lives in northern Utah with her husband, four children, and a dog who is insanely jealous of her laptop. When not writing Lorin enjoys creating graphics, visiting historical sites, museums, and reading. Lorin is an active member of the League of Utah Writers. Her debut novel, Waking Lucy, was awarded a 2017 Recommend Read award in the LUW Published book contest. 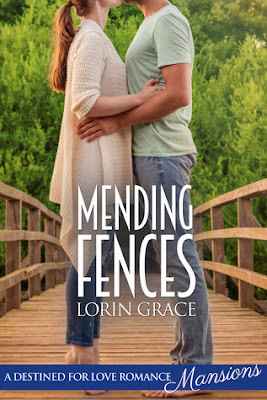 Mending Fences received a 2018 Recommend Read award in the LUW Published book contest. Giveaway Details $25 Amazon Gift Code or $25 in PayPal Cash Ends 2/14/19 Open only to those who can legally enter, receive and use an Amazon.com Gift Code or Paypal Cash. Winning Entry will be verified prior to prize being awarded. No purchase necessary. You must be 18 or older to enter or have your parent enter for you. The winner will be chosen by Rafflecopter and announced here as well as emailed and will have 48 hours to respond or a new winner may be chosen. This giveaway is in no way associated with Facebook, Twitter, Amazon, BookBub, Instagram, Rafflecopter or any other entity unless otherwise specified. The number of eligible entries received determines the odds of winning. This giveaway was organized by Kathy from I Am A Reader & Clean Wholesome Romance and is sponsored by the author. VOID WHERE PROHIBITED BY LAW. The fence that once brought them together now keeps them apart. Mandy needs one last photo to complete her MFA project, digitally transforming the deteriorating Crawford mansion into the stately building it could have been. But a fence stands in her way. Determined to keep land developers and paparazzi from his great-grandfather’s estate, Daniel Crawford has taken to chasing off intruders by any means possible. No one is going to cross the fence into his land. Or his heart. I enjoyed this story for the most part, there was some great back and forth between Mandy and Daniel. I just wished there was more that they based their relationship on than one summer spent together as children and two or so dates as adults. It felt underdeveloped and I think their relationship would have felt more substantial if there had just been... more. It was the details that made this story stand out to me- the house of artists with each kitchen cupboard featuring a different painting from the masters, the chalkboard in the basement for visitors to sign, the creativity of Mandy's MFA project. Mandy's friend and housemate Candace was also a fun supporting character and I felt like I was able to see more between the two of them than Mandy and Daniel.